The most exciting thing about archaeology is the way fresh discoveries can overturn established theories in the blink of an eye. Witnessing how a new consensus emerges from these is also thrilling, and the sight of scholars with opposing views scoring and conceding points is a conference staple. Ultimately this debate forges our perceptions of the past. This issue we bring you one such debate in its raw form. 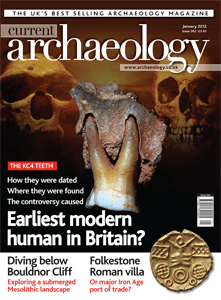 The announcement that a jawbone found in Kent’s Cavern, Torquay, is not only modern human, but also from the earliest modern human in Britain grabbed many headlines this month. Less reported was the concern among archaeologists working in the cavern that the deposits were unsuitable for the dating technique used. Here we present the arguments, and take a detailed look at major research underway in the cave. Another important discovery is the existence of a key Iron Age settlement under the Roman villa at Folkestone. As archaeologists race to excavate the remains before they are lost to the sea, we examine a prehistoric port on the scale of Hengistbury Head. The Mesolithic site at Bouldnor Cliff is already underwater. Publication of research there provides an opportunity to catch up with the latest findings. Finally, the excavation of a late Roman octagonal building has reignited debate about the purpose of these high-status structures. Were they custom built for the bulk baptism of pagans? THE FIRST MODERN HUMAN IN BRITAIN? Why has a small fossil from Kent’s Cavern triggered debate between some of the UK’s leading prehistorians? Hunting for hyaenas, woolly rhinoceros, and Neanderthals in the middle of Torquay. Kent’s Cavern experts Dr Paul Pettitt and Dr Mark White respond to the controversial new findings. Roman villa or Iron Age oppidum? Archaeology on the edge: exploring a precarious clifftop excavation. Underwater fieldwalking and excavating by lobster. Dipping into the story of an enigmatic Roman building. Further details on what promises to be our biggest conference yet. Andrew Selkirk celebrates the half-century of an ever-expanding institution.